- m 3 x 0.5. - m 3 x 0.6. - m 4 x 0.7. 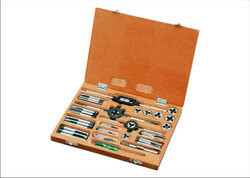 Banking on the skills of our qualified team of professionals, we are involved in providing Tap Die Set. - High-quality milled alloy steel tool. - Cut new material or chase lightly damaged threads. - Taps and dies for hand threading applications. - Tapered coarse and fine taps and dies start easily and prevent overthreading. - Storage case keeps everything neat and organized. Backed with support of professional’s team, we are betrothed in providing a faultless range of Groz Tap and Die Set to the valuable clientele. Our firm is a foremost name, involved in providing a diverse range of Tap Die Set. Experts use the advanced techniques to develop this product as per client’s demand. It is used for tapping and threading. We are engaged in offering our clients with Tap & Dies Set in wodden box, these are used for various industrial applications and are available in following sizes. Minimum Standard Packaging Is Required. 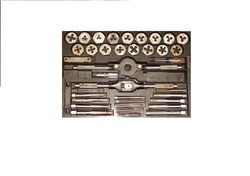 We provide complete taps & round die sets.